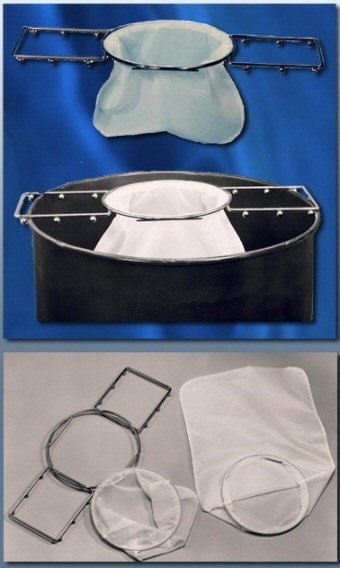 The Knight Redi-Filter is a steel rack that is designed to hold Knight Filter Bags. It fits on anything from a five gallon paint bucket to a fifty-five gallon drum and has knobs to prevent lateral movement. Liquid is poured through the filter into the can or drum. When the operation is complete, both the rack and the filter bag can be removed, cleaned and placed on another can, ready to go again. Knight makes the standard filter for use with the Redi-Rack. However, larger bags of any material or micron may be purchased. The Knight Redi-Filter System is a unique way to solve filtration problems, either on new applications or by replacing the tie-on to bag. 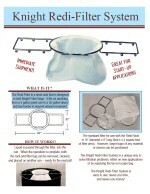 The Knight Redi-Filter System is easy to use, saves you time and money.